The Sunday bird walk went to Beck Creek in south Nanaimo. The morning was partly cloudy and warm. 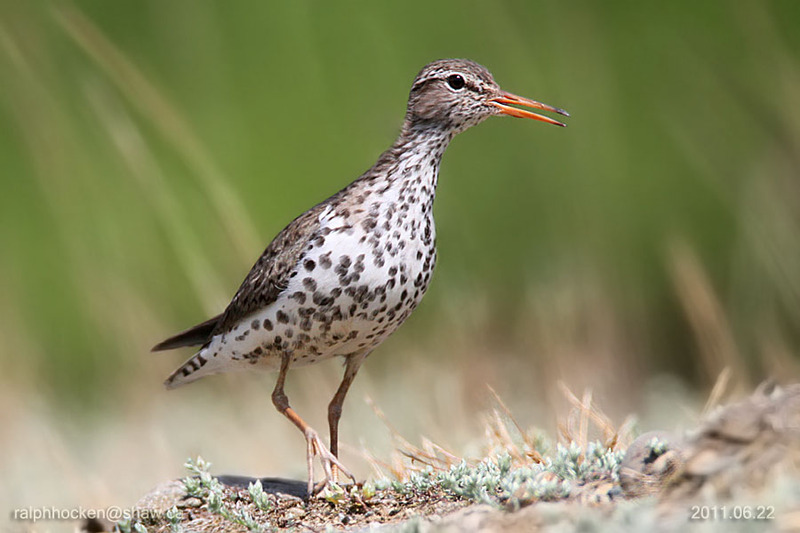 We saw two Lesser Yellowlegs and three Spotted Sandpipers feeding on the mudflats. A Red-tailed Hawk flew by overhead. We heard several Pacific-slope Flycatchers and Red Crossbills during the morning. Two Black Swifts flew high overhead. Canada Goose, Great Blue Heron, Turkey Vulture, Bald Eagle, Red-tailed Hawk, Glaucous-winged Gull, Band-tailed Pigeon, Rock Pigeon, Belted Kingfisher, Lesser Yellowlegs, Spotted Sandpiper, Anna’s Hummingbird, Rufous Hummingbird, Northern Flicker, Northwestern Crow, Common Raven, Purple Martin, Barn Swallow, Chestnut-backed Chickadee, Black Swift, Red-breasted Nuthatch, Brown Creeper, Pacific Wren, Bewick's Wren, Bushtit, Pacific-slope Flycatcher, Golden-crowned Kinglet, Swainson's Thrush, American Robin, Cedar Waxwing, Spotted Towhee, Song Sparrow, Black-headed Grosbeak, Brown-headed Cowbird, House Finch, American Goldfinch, Red-winged Blackbird, Pine Siskin and Red Crossbills. Six Common Nighthawks were seen flying east over Corfield Street near Despard Avenue in Parkville. 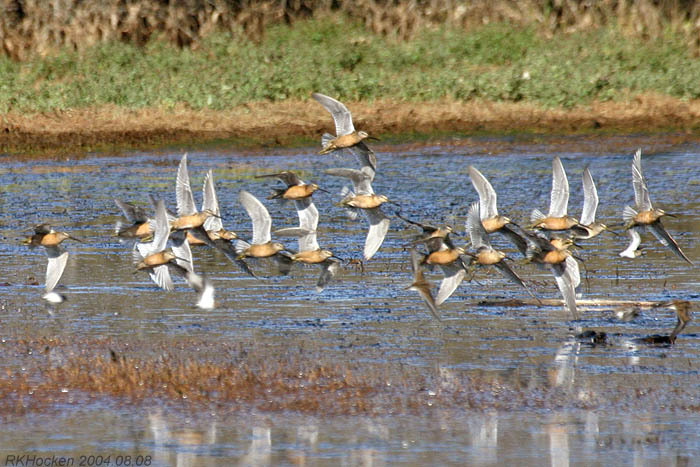 Four Semipalmated Plovers, Killdeer, Semipalmated Sandpipers, Western Sandpipers and Least Sandpipers were seen at San Pariel on the mud flats along the Englishman River Estuary in Parksville. A Barred Owl was seen at Bowen Park in Nanaimo. A Great Horned Owl chick was seen in Colliery Dam Park in the cedar grove above the rock cliff near the Upper Lake in Nanaimo. This chick has been seen from July 23 until July 27 at the same location. The early birders went to the Shelly Road side of the Englishman River in Parksville. The morning was sunny and warm. We saw many Savannah Sparrows and Willow Flycatchers in the meadows. A female Northern Harrier flew over the meadows and then perched in a conifer tree for a long time. We spotted a pair of American Kestrels in the top of a tall conifer tree and the female Kestrel flew over just above us giving us great views. We spotted a Red-breasted Merganser, three Black-bellied Plovers, two Black Oystercatchers, three Caspian Terns, Mew Gulls and Glaucous-winged Gulls near the tide line. House Finch, Red Crossbill, American Goldfinch and House Sparrow. A pair of American Goldfinch were seen feeding at backyard feeders along Overlook Drive in Nanaimo. A Northern Harrier was seen along Rivers Edge in Parksville. Five Caspian Terns were seen flying along shore line and resting on a bar at the beach access at Little Qualicum River Estuary in Qualicum Beach. 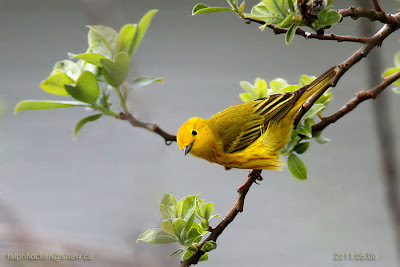 A Red-eyed Vireo was heard singing in a Lot Ten along the Little Qualicum River in Qualicum Beach. A Common Nighthawk was spotted over the Eaglecrest area of Qualicum Beach. A possible female Yellow Grosbeak was seen along Jensen Avenue West in Parksville at a third floor balcony feeder for about ten minutes on Friday July 22 at 12:30 pm. The birder made notes of the large black beak and the very unusual streaking on top of the head and throughout the back and also there were white patches on the wings. The Yellow Grosbeak has a large range reaching up to roughly 300,000 square kilometers. This bird is normally found in Guatemala, Mexico and the United States. Sixty Common Nighthawks were seen over Country Club Mall in Nanaimo. Five Common Nighthawks were spotted flying over Lancashire Avenue in Nanaimo. An American Bittern was seen at Buttertubs Marsh in Nanaimo. WildResearch, a Vancouver base non-profit, is pleased to be offering a pelagic birding trip departing from Ucluelet on the Sunday the 18th September 2011. The ship we will be using is the M.V. Frances Barkley, a 39m (128ft), 300 ton coastal freighter. The cost per person is $200 for WildResearch members. A possible Yellow Grosbeak was seen at a third floor balcony feeder for about ten minutes in Parksville on Friday July 22, 2011. The birder made notes of the large black beak and the very unusual streaking on top of the head and throughout the back and also there were white patches on the wings. The bird walk went to the Shelly Road side of the Englishman River in Parksville. The morning was sunny and warm. 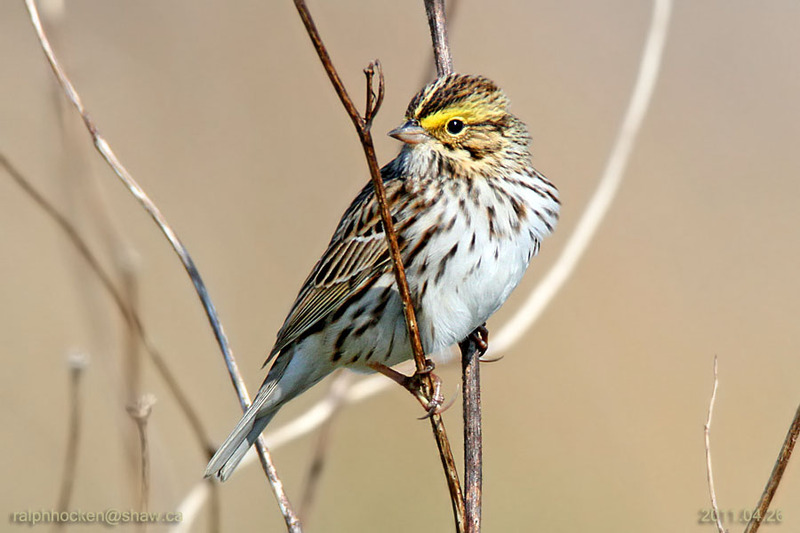 We saw many Savannah Sparrows and Willow Flycatchers in the meadows. A female Northern Harrier flew over the meadows and then perched in a conifer tree for a long time. We spotted a pair of American Kestrels in the top of a tall conifer tree and the female Kestrel flew over just above us giving us great views. We spotted a Red-breasted Merganser, three Black-bellied Plovers, two Black Oystercatchers, three Caspian Terns, Mew Gulls and Glaucous-winged Gulls near the tide line. The Sunday bird walk went to the Ladysmith Maritime Society Marina in Ladysmith. beach access at Little Qualicum River Estuary in Qualicum Beach. Colliery Dam Park in Nanaimo. A Dark-eyed Junco was spotted on a nest at Colliery Dam Park in Nanaimo. The following fifty-five species were seen at Columbia Beach and French Creek. September 6, 2011. Have a great summer! 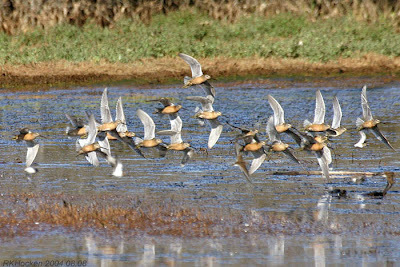 The early birders are heading out tomorrow at 7:30 a.m. We will meet at the usual meeting spot at the Parksville Bay near the Lions playground at 7:30 am or at our usual spot at Shelly Road side of the Englishman River at about 7:35 a.m.
"Pelagic birding trip in September"
coastal freighter. The cost per person is $200 for WildResearch members. Double-crested Cormorants, Pelagic Cormorants, a Bonaparte's Gull, a Ring-billed Gull, a California Gull, a Herring Gull, several Glaucous-winged Gulls, a Caspian Tern, two Pigeon Guillemots and Marbled Murrelets were seen from the shore at Columbia Beach. Seven birders saw and heard the following fifty-six species of birds. 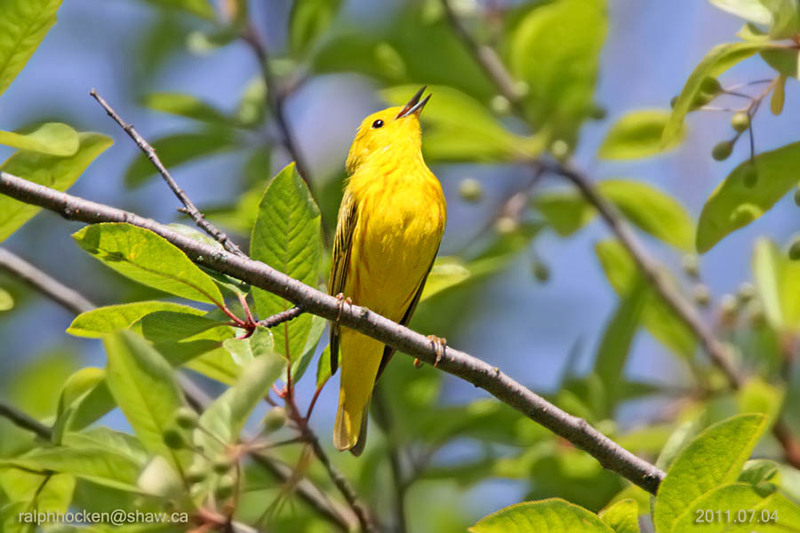 The early birders go birding on Mondays at 7:30 a.m. We will meet at the usual meeting spot at the Parksville Bay near the Lions playground at 7:30 am. The Sunday bird walk went to the Top Bridge Trail in Parksville. The morning started out cloudy and cool but soon turned warm and muggy. The highlight of the morning was the sighting of a newly fledged Swainson’s Thrush sitting very quietly on a conifer tree about two feet above the ground near the trail. We all got to have a good look at him. There was a Western Tanager perched on a conifer tree, about six feet from the ground, just off the trail. Again, we had a great opportunity for some good looks. Warbling Vireo, Northwestern Crow, Common Raven, Violet-green Swallow, Chestnut-backed Chickadee, Red-breasted Nuthatch, Pacific Wren, Swainson's Thrush, American Robin, Western Tanager, Black-throated Gray Warbler, Spotted Towhee, Chipping Sparrow, Song Sparrow, White-crowned Sparrow, Dark-eyed Junco, Purple Finch and American Goldfinch. A female Wood Duck with two ducklings were seen today at Buttertubs Marsh in Nanaimo. 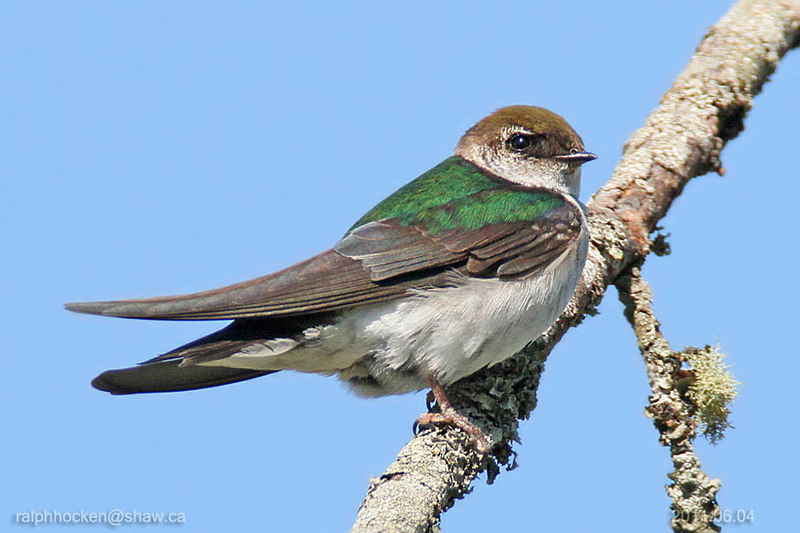 A female Rufous Hummingbird was seen feeding along the gravel trail at Buttertubs Marsh in Nanaimo. American Robin, European Starling, Cedar Waxwing, Orange-crowned Warbler, Yellow Warbler, Black-throated Gray Warbler, Common Yellowthroat, Western Tanager, Spotted Towhee, Song Sparrow, Black-headed Grosbeak and American Goldfinch were seen at Lot Ten near the Little Qualicum River in Qualicum Beach. A Yellow-headed Blackbird was spotted along Claymore Road in Qualicum Beach. Twelve Caspian Terns were seen at Cowichan Bay. A Black Swan was seen on the river at the Big Qualicum River Bay Campground in Qualicum Bay. 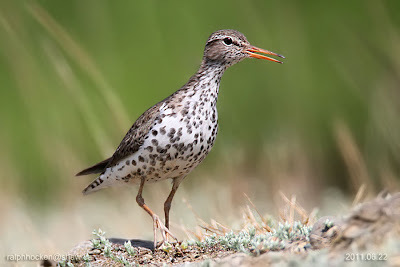 Fifteen Least Sandpipers in breeding plumage and a Greater Yellowlegs were seen at the small tidal pond on the Columbia Beach side of French Creek. A family of Chipping Sparrows is visiting a backyard along Ruby Crescent in Nanaimo. Chipping Sparrows, White-crowned Sparrows, a Pileated Woodpecker and a Downy Woodpecker are visiting feeders in a backyard along Meridian Way in Parksville. seen at the small tidal pond on the Columbia Beach side of French Creek. A pair of Eurasian Collared Doves was seen near Divers Lake in Nanaimo. landed on a tall post nearby for some good views. block of Uplands Drive in Nanaimo. resume on September 6, 2011. Have a great summer!